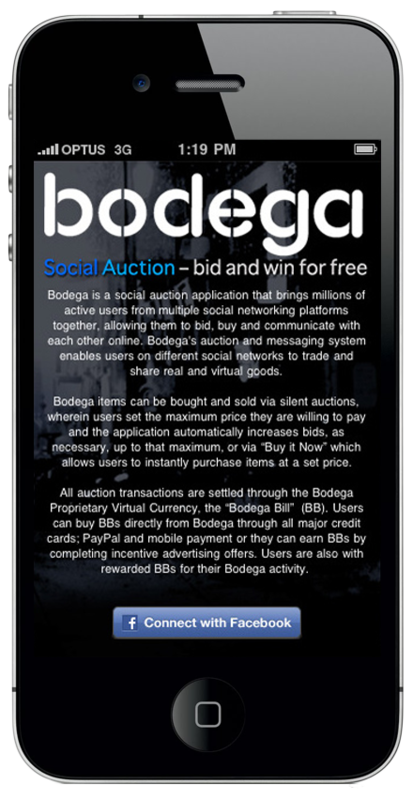 Bodega is a social auction application that brings millions of active users from multiple social networking platforms together, allowing them to bid, buy and communicate with each other online. Bodega’s auction and messaging system enables users on different social networks to trade and share real and virtual goods. Bodega items can be bought and sold via silent auctions, wherein users set the maximum price they are willing to pay and the application automatically increases bids, as necessary, up to that maximum, or via “Buy it Now” which allows users to instantly purchase items at a set price. All auction transactions are settled through the Bodega Proprietary Virtual Currency, the “Bodega Bill” (BB). Users can buy BBs directly from Bodega through all major credit cards; PayPal and mobile payment or they can earn BBs by completing incentive advertising offers. Users are also with rewarded BBs for their Bodega activity.